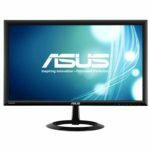 The affordable ASUS VH238H display is an excellent budget monitor that offers crisp and sharp Full HD image quality. It is ideal for casual gaming, movie watching, and everyday use as it has pre-calibrated picture presets for each activity. Moreover, it features extensive connectivity, built-in speakers, and a sleek and modern design. If you’re looking for a cheap but good 1080p monitor, this is it. The ASUS VH238H PC screen delivers a surprisingly good performance considering its price. The rapid 2ms response time completely removes ghosting of the fast moving objects in the everyday use of the computer as well as in the fast-paced video games. Therefore, it’s a great budget gaming monitor as the picture looks vibrant in video games thanks to the optimized presets while the 1080p resolution offers crisp and brilliant details. Although TN panels usually make for rather poor viewing angles, that’s not the case with the ASUS VH238H display. Due to the Smart View technology, the ASUS VH238H provides excellent viewing angles of 170 degrees horizontal and 160 degrees vertical, allowing you to enjoy the viewing experience from basically all angles. For the improved viewing angles, be sure to enable the Smart View feature in the OSD menu, under the Color settings. Another useful feature is the ASUS Smart Contrast Ratio which incorporates the dynamic contrast of 50,000,000:1 for the superior relationship between the darkest and the brightest colors. Instead of manually activating this feature whenever you need it, you can simply use the pre-calibrated ASUS Splendid Video Intelligence Technology presets. These presets have calibrated color, brightness, contrast, and sharpness settings in order to provide you with the best viewing experience depending on what you’re watching on the screen. These preset modes include Scenery, Theatre, Game, Night View, sRGB, and the Standard mode. The Night View preset is especially useful when watching dark themed movies or playing video games with dark scenes while the sRGB preset is ideal for photographs and graphics. You can easily toggle between these presets via the first OSD button at the bottom bezel. The OSD buttons can also be used as shortcuts for auto adjustment, quick adjusting of brightness and contrast, volume settings, and swapping between the input sources. Once you open up the menu, you will be able to quickly adjust all of the settings as the menu is quite plain and easily navigatable even though the OSD button are a bit clunky. Under the Color settings section of the menu, you will be able to adjust parameters such as the brightness, contrast, saturation, color temperature, skin tone, and the smart view feature. The Color temperature setting includes four presets including Cool, Normal, Warm, and the User mode in which you can manually configure red, green, and blue color levels. In the Image settings, you can adjust sharpness, aspect ratio, analog settings of the VGA port such as position and clock, and the trace free feature which can further increase or decrease the response time speed. Lastly, in the System settings, you can enable the Eco mode which saves up the power consumption but delivers lesser gray levels in return. However, the brightness and color enhancement will remain intact yet the power consumption will be reduced to around 23W. 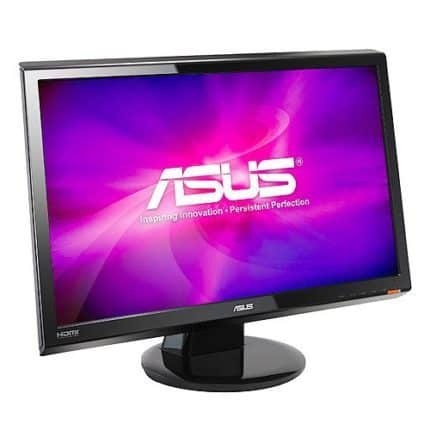 The ASUS VH238H monitor features a glossy black design with a plastic bezel. 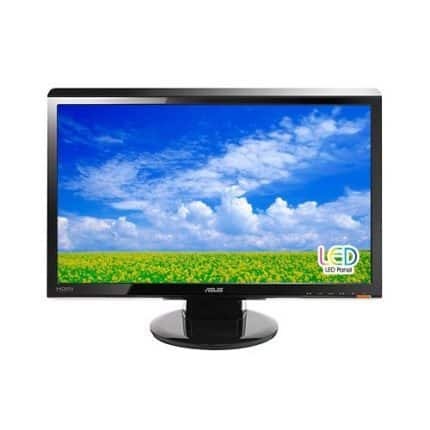 The screen of the monitor is coated with an anti-glare protection which eliminates the sunlight reflection. The stand of the base provides decent stability, however, as far as ergonomic are concerned, it can only be tilted by -5, +20 degrees. It is also VESA mount compatible for an easy installment on the wall. The ports include one VGA, one DVI-D, and one HDMI 1.3. There are also audio ports at the back, one of which is for the internal 2x2W speakers and the other one can be used for headphones. The speakers perform better than expected at this price point, and will certainly satisfy you if you have no extra speakers. All ports are placed at the back of the monitor facing downward which may cause minor frustration when connecting, but there is a cable management hole through which you can route the cables. The ASUS VH238H price amounts to $120 at the moment (May 2017). Considering the Full HD image quality and the extra features, it’s safe to say that the price is quite reasonable. In the box of the monitor, you will receive a VGA cable, a DVI cable, an audio cable, a power cord, a quick start guide, and a three-year warranty card. If you need an HDMI cable, you will have to purchase it separately and be sure to pick up at least version 1.3. For a fair price, the ASUS VH238H TN monitor can deliver the Full HD 1080p resolution with expressive details and vibrant picture quality. Alas, the colors aren’t as rich and accurate as they’re with the IPS panel monitors, but they’re more than satisfactory for the money. This monitor is ideal for casual gaming due to the gaming presets for dark themed video games and the quick response time for minimal ghosting. All in all, for a $120 monitor, the ASUS VH238H delivers a surprisingly good performance and picture quality which makes it worth more. 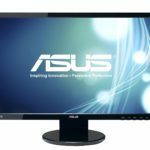 The ASUS VH238H is a brilliant budget monitor that offers Full HD 1080p resolution, crisp image quality, quick 2ms response time, and some exciting features including the superior viewing angles, smart dynamic contrast ratio, and well-optimized picture presets. All of that is complemented by a nice design which makes the ASUS VH238H a great choice for those with a tight budget.